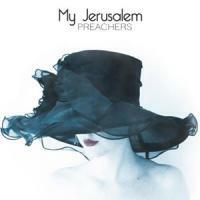 Preachers, the sophomore release from Austin's My Jerusalem has the rather dark and sinister theme going on in the background. Founder and singer Jeff Klein (ex-Gutter Twins, The Twilight Singers) describes it as the Post-Modern Southern Gothic Soul album surrounded by beautiful, comforting, darkness. It's real, not selfish, according to the mad hatter and Klein's baritone vocals are ever so moody and emotionally black. Now, I haven't been listening to their debut (only to some of Klein's solo material), but it's supposedly a much lighter and easier going effort. Here, the opening title track literally reeks of big drama, grand piano, avant-garde, a special nod to religion or rather the lack of religious beliefs? as the lyric tells about blood, sin, and lines such as 'this preacher ain't no pacifist'. Klein and company have basically decided to remove hard drives and laptops to make way for old school analog tape machines and vintage keyboards. Making this more into and about expression and in the vein of the complex music of The Mission and The Velvet Underground? You need to spin this several times and really spend quality time to get the full picture. Not exactly 'easy listening' and My Jerusalem are definitely nocturnal creatures with a soft spot for the macabre. I do however miss the important change of pace and tempo and the choruses are not always razor sharp. Preachers - moments of clarity followed by layers of smoothing (slow/mid tempo) darkness that abruptly shifts into modern lounge music for the broken hearted? Yep... nailed it !